A selection of free printable tooth fairy certificates to use when your child’s teeth fall out! There are eight different versions that you can print for free. You can type in your child’s name and even add her photo! The following printables use “boy colors” for those boys who won’t have pink or lavender. I don’t know how many kids actually still believe in the tooth fairy by the time their teeth fall out but the idea of the tooth fairy is still magical and exciting. Even kids who know exactly who the tooth fairy is, still wait in anticipation for the visit often even hoping to catch their mom or dad in the act. 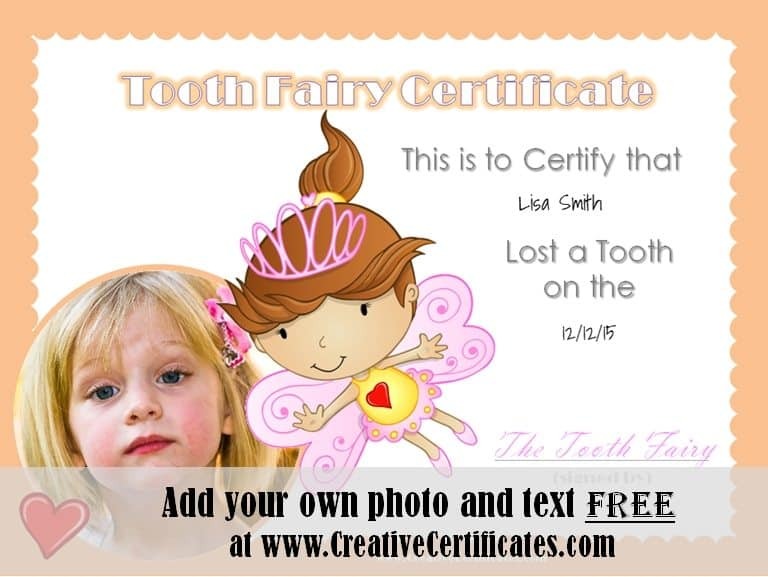 If you are looking for tooth fairy ideas to make the visit more memorable you might like to try one of the following ideas. For those who want to print something ready and not devote too much time to this, we offer free tooth fairy printables that can be completed within minutes. Just select the printable of your choice, fill in your child’s details and leave it on her pillow or next to her bed at night. All printables will remind you of this magical milestone for years to come. 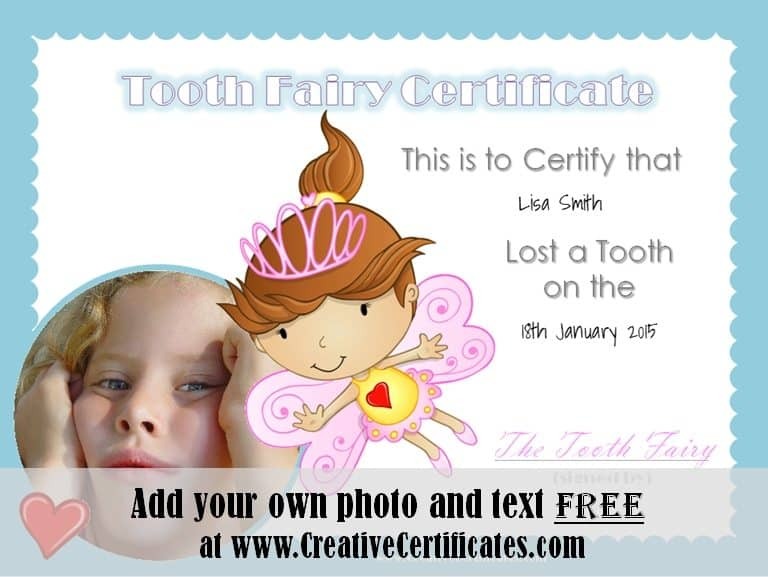 Print one of our tooth fairy certificates above to celebrate this magical moment. Add some glitter to the printable certificate to make it sparkle. 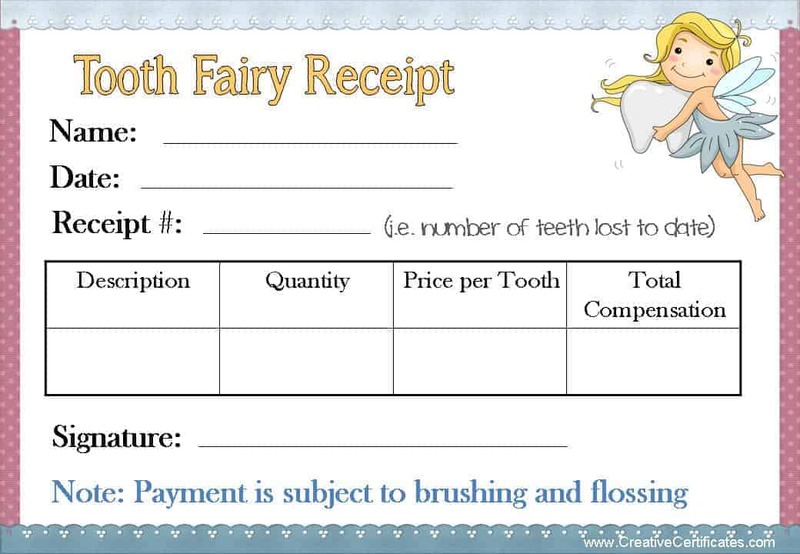 Print a tooth fairy receipt from the selection above to leave your child once you take the tooth. The receipt can be kept for years to remember this exciting milestone. Some people make tiny little footprints that look like they were left by the fairy. To make the prints, use a cotton bud, your thumb or tiny doll shoes if you have any. You can use eyeshadow, talcum powder or glitter. My boys don’t like “girly stuff” so I made them footprints with a bit of mud that I just wiped off in the morning. They liked that! Boys often relate more to mud and dirt than to glitter and “girls stuff”. At least mine do! They laughed when they saw the small muddy prints. Silver glitter doesn’t really do it for them. Sprinkle glitter (fairy dust) on the floor from the bed to the window and leave it slightly open. Try and find a brand that doesn’t make too much of a mess. Glitter somehow seems to get everywhere. Foil confetti is a great alternative. What can you leave the tooth in for the tooth fairy? Sew a little pillow to leave the tooth on. It’s really simple to make. Cut a rectangle out of shiny fabric and sew three of the sides. Turn it inside out and stuff it with cotton wool. Handstitch the last side to close the pillow. You can use puffy paint or a permanent marker to write your child’s name on the cushion. Write on the scraps of fabric first to ensure it doesn’t run. Take a small envelope and decorate it with glitter or stickers. 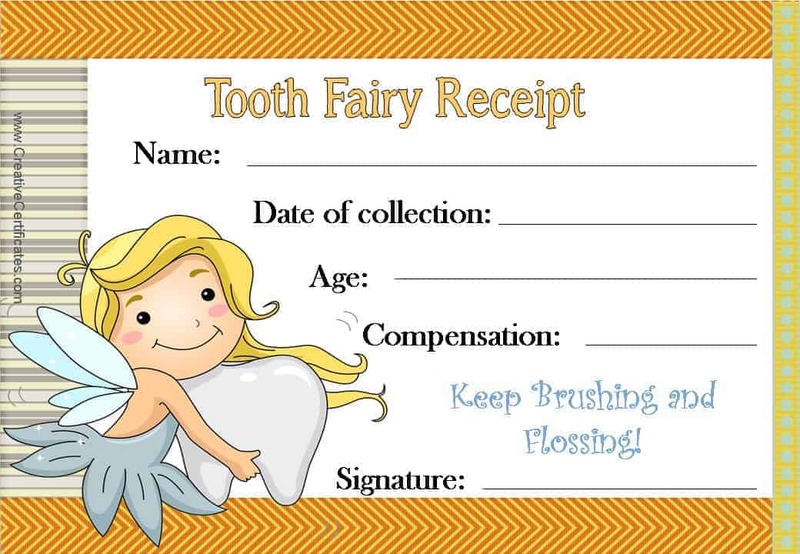 Use one of our printable envelopes for the tooth fairy. Buy a little organza bag. They are sold online or in many stores. They are really cheap and look like miniature shiny sacks. Perfect for this purpose! 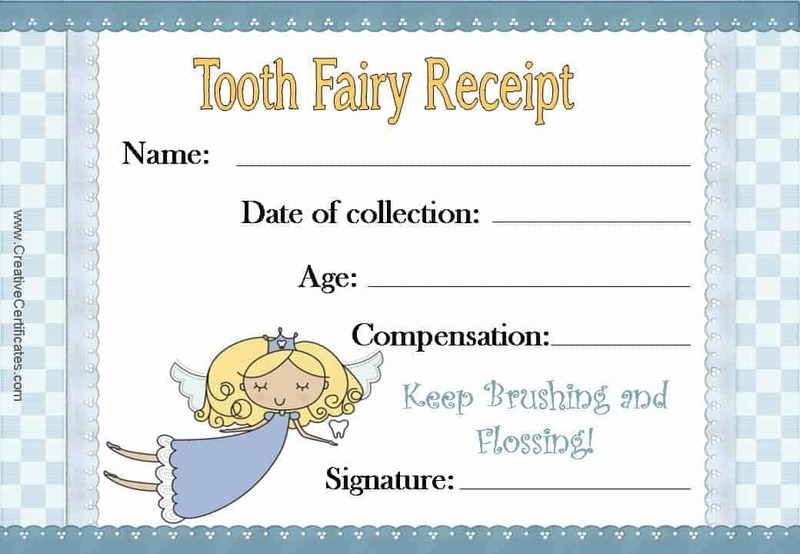 What “compensation” can you leave for the tooth from the tooth fairy? Decorate a dollar bill (or however much money you decide to give) with glitter. If you can obtain a $2 dollar bill your kids might get a kick out of receiving this relatively rare bill from the tooth fairy. Leave a small bag of gold covered chocolate coins. You can buy little organza bags that can be filled with the chocolate coins. Type a letter from the tooth fairy to the child in a tiny font and print it on pretty paper. Cut it out and roll it up. Tie it with a pretty ribbon. In the letter congratulate your child and write something complimentary. Don’t forget to remind him to look after his teeth! Why give a tooth fairy certificate? Firstly, your child will appreciate it and it doesn’t cost anything. Many kids see this as an important milestone which confirms that they are growing up. Secondly, it enables you to remember this special moment, when it happened, how your child felt, etc. We tend to forget these memorable moments too quickly. 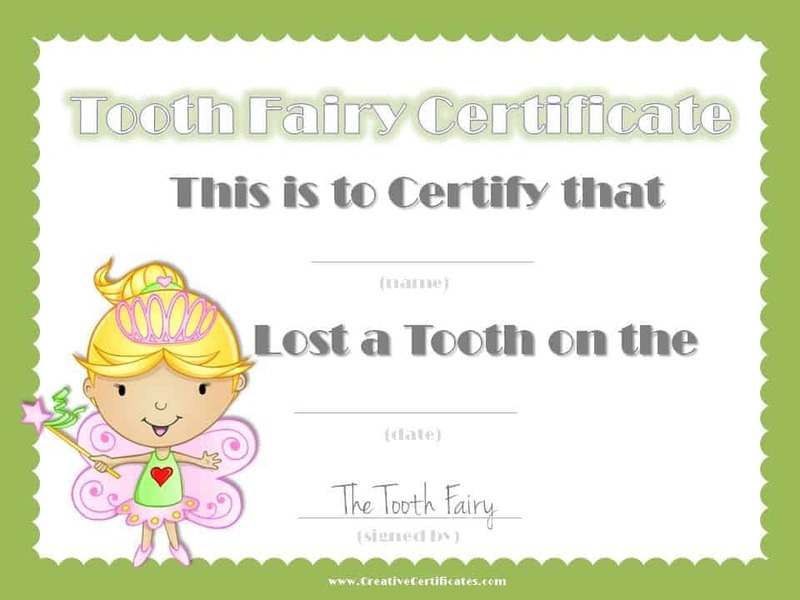 You can store the certificate with the actual tooth and keep it together with things you are saving for your child. 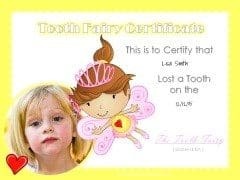 If you don’t want to make an effort for each tooth that falls out then you can create a printable for the “first tooth” only.